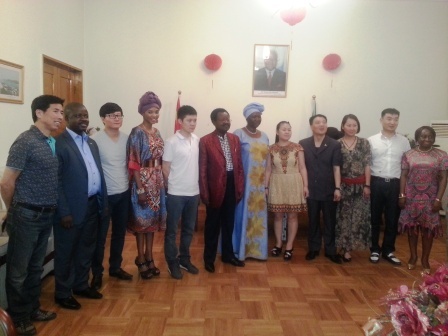 Sierra Leone’s first female Deputy Ambassador to the People’s Republic of China, Madam Kumba Alice Momoh was on Wednesday, 4th June given a rousing and befitting welcome by staff of the Mission, including His Excellency Ambassador Victor Bockarie Foh and dozens of Sierra Leoneans in Beijing and Chinese nationals. Madam Momoh arrived in Beijing to take up duty on the 19th.of May, this year following herappointment as Deputy Ambassador by President Koroma in March, 2014. Speaking on the appointment of Kumba Alice Momoh as Deputy Ambassador to China,Ambassador Victor Bockarie Foh said, “this is the first time in forty three years of diplomatic ties with China that a woman has been appointed as Deputy to the Mission”. The Deputy Ambassador, HE Foh said has a respectable presence and has come in with a wealth of experience in the field of Education and Administration from the United Kingdom. “For a political appointment like this, it is purely the prerogative of the President and assured all that Madam Deputy Ambassador appropriately merits the appointment. Before her appointment, Mrs. Momoh was Chair Person of the All Peoples Congress (APC) Branch, Britain and Northern Ireland. Mrs. Momoh held this position with distinction notwithstanding the turbulence that normally goes with Senior Political Offices everywhere. Leone in general, but that she was particularly representing Sierra Leonean women. “You should take into account gender related issues at all times, more especially because both Sierra Leone and China are currently positioning women in high level and sensitive decision making governmental and private sector positions. According to Ambassador Victor Bockarie Foh, the success of the Mission depends on many factors including performance as a Mission and requisite support it gets from Sierra Leoneans from all shades of political divide. Ambassador Foh also highlighted the crucial role played by Sierra Leone in getting China into the United Nations Security Council; at a time when few countries could image that China could be a leading world economy. Madam Momoh paid special tribute to Ambassador Foh for his “steadfastness, hard work and love for the ruling party” especially taking cognizance of the role Ambassador Foh played in ensuring APC victories in 2007 and 2012 general elections in Sierra Leone. To Embassy staff, Madam Momoh said, Sierra Leone comes first and that “our role in the Mission is to represent every Sierra Leonean in China and all other countries the Beijing Mission is accredited to”, whilst committing herself to working with everyone collectively for the good of our country and China. She also encouraged her compatriots, all Sierra Leoneans to be coming to the Mission and to be law abiding. “The development currently taking place in Sierra Leone is for all Sierra Leoneans so let us don’t play politics with that”, she cautioned. Chairing the programme was Madam Madelyn Well, a member of the Sierra Leonean Community in Beijing, China. Side shows included performance by Presidential Gold Medalist, the great Artist Mariatu Kargbo. Madam Kumba Alice Momoh is coming in as Principal Assistant to the Ambassador.